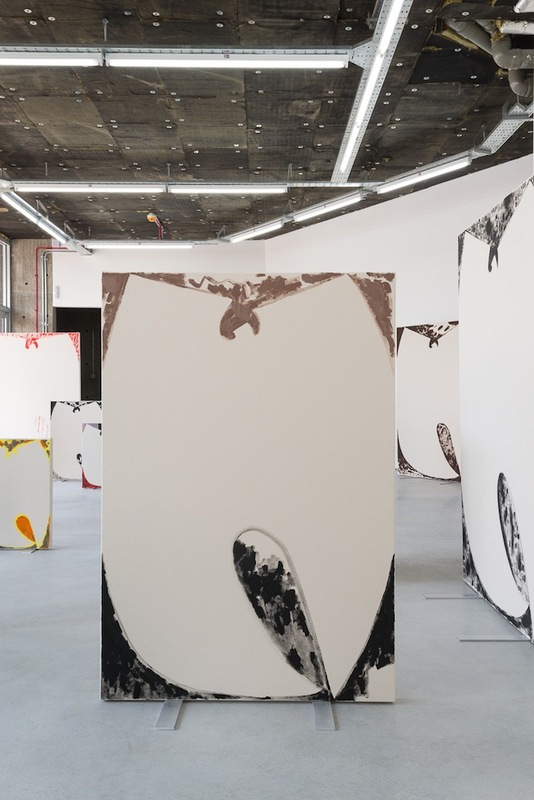 40 "Standing Paintings" currently occupy the floor space of Rod Barton's gallery in London, each displaying the outlines of Wu-Tang Clan's symbol "W" on their front side. 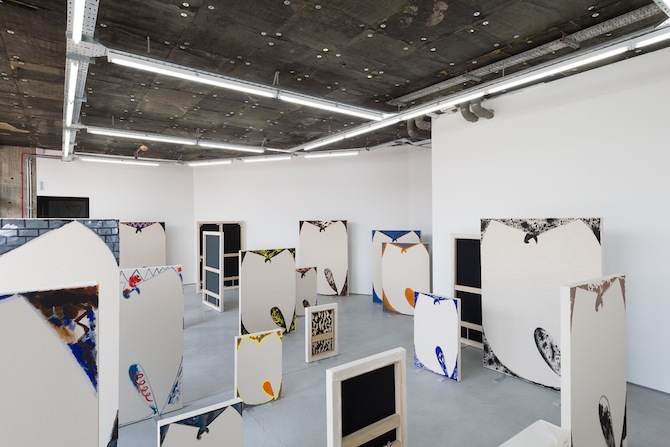 They were created by 1989-born American artist Luc Fuller, who employs his art to explore cultural appropriation, the merging of sub- and high-culture and eventually in the meaning-production of signs, arrangements and exhibition formats. 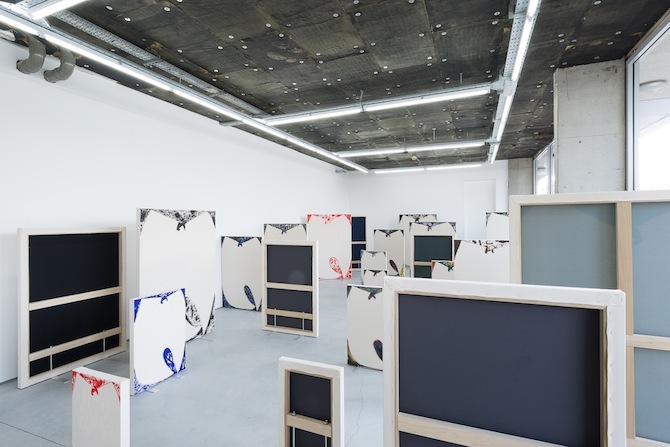 While painting is a medium commonly defined by its spatial distance to its spectators and its status as an object on a wall that is to be observed, Luc inverts this scheme and incorporates his paintings in an environment, rendering them into a "democratic" pattern. Visitors thus walk through the paths formed by his works, they enter a scene of art – a painting-scape. 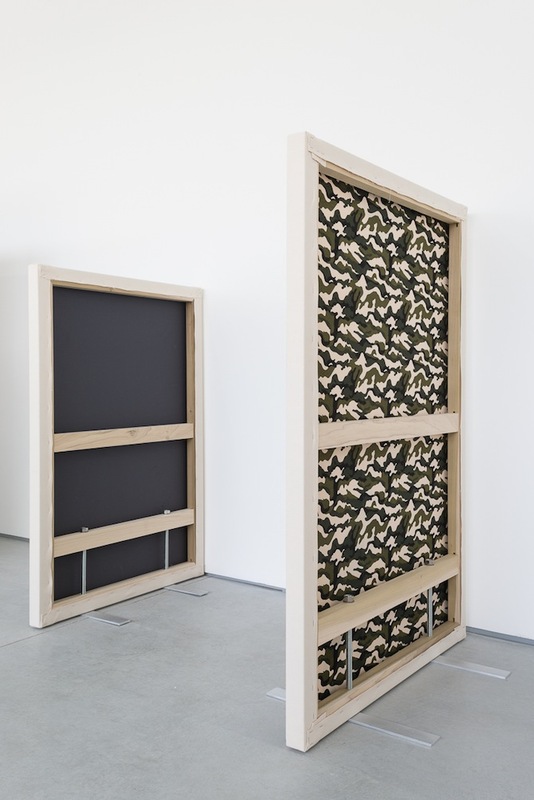 Also in other exhibitions that Portland-based Luc did, he repeatedly questions the classic terms of installation, materiality and space – everything is, as he once said, in "flux". 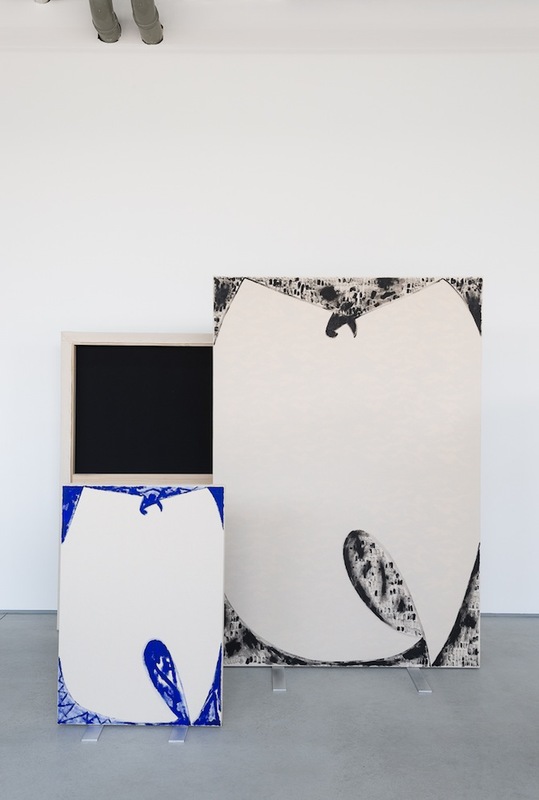 In our interview with the artist, Luc told us about why and how Wu-Tang Clan's symbol is a part of his work, his fascination with subcultures and about his playful and similarly ambitious approach of reconsidering exhibition formats. Luc, your exhibition concept is quite special: The amount of your paintings seems to form an environment or a labyrinth, rather than following a classic installation. Why did you decide to withdraw paintings from the wall space, and instead place them on the floor? I initially got the idea when I was working on a piece for a group show at Outpost. 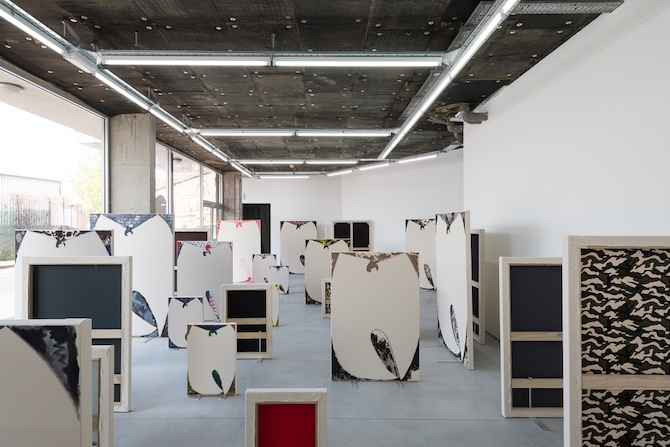 This is a project space in Glasgow, which was curated by the London- (and soon to be Berlin-) based artist duo Peles Empire. They wanted the entire show to occupy the floor of the gallery without anything on the walls. When I heard this, a lightbulb went off immediately. I told them I wanted my painting to stand upright in the middle of the floor. When Rod Barton asked me to do the solo show at his gallery, I wanted to take the same concept, but see how far I could push it. 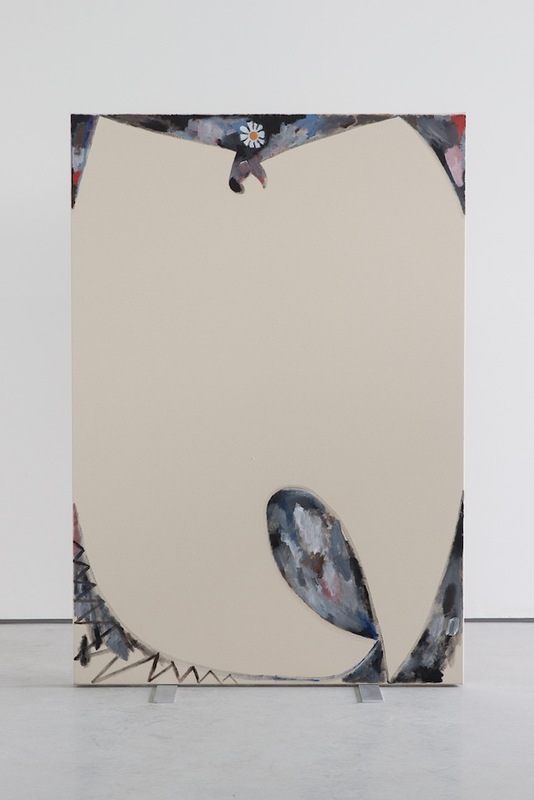 I think the standing paintings achieve something that traditional painting installations do not. For one, there is a different kind of relationship to the body when you encounter the objects in three-dimensional space. You become more aware of your own body. The paintings become bodies as well: vulnerable, awkward, and with a frontside and backside. This simple gesture shifts the lineage of painting-as-an-authoritative-statement on the wall to something much more democratic, and I suppose playful. Many of your works are also coloured or patterned on their rear side. Do you consider your paintings to be sculptures? I am not sure how necessary it is for me to categorise them as either. What is a painting? What is a sculpture? If I had to, I would say they are paintings disguised as sculptures, or sculptures disguised as paintings. It doesn’t really matter. But as objects on the floor, I think we are forced to see them more objectively. The coloured fabrics on the back are more formal than anything. They may reference color-field painting, fashion or uniforms. Is there a reason why you incorporated so many works? My intention to have so many works was to play with both uniqueness and ubiquity, but also to create an environment which is both overwhelming and enchanting. Honestly, I could have hung a couple of Wu-Tang paintings on the wall and talked about ubiquity, but really, the Wu-Tang symbol is already entirely ubiquitous - without any intervention on my part. But by creating this labyrinth, I think other questions arise: about cultural production, consumption and participation. This show was a challenge for myself to consciously shake things up a bit, even if that meant making things a little crazy, and kind of awkward. One thing that surprised me after the installation was complete, was how quiet the gallery became, even though visually it was quite loud. All 40 paintings acted as acoustic panels, absorbing any sound in the gallery. The recurring motif – "W" – is an abstracted version of Wu-Tang's logo. Since when and why is this symbol interesting to you? It started as kind of a joke drawing in my studio, which sat for about a month before I tried making a painting out of it. I eventually started painting it over and over again, not as obsessive fan art, but rather in conjunction to a more research based investigation into the social relationships between people, symbols and culture. What became most obvious was that even though the Wu-Tang Clan emerged in New York in the early 90’s in a very specific and racialised context, today many people are divorced from that context and the place it sprouted from (myself included). 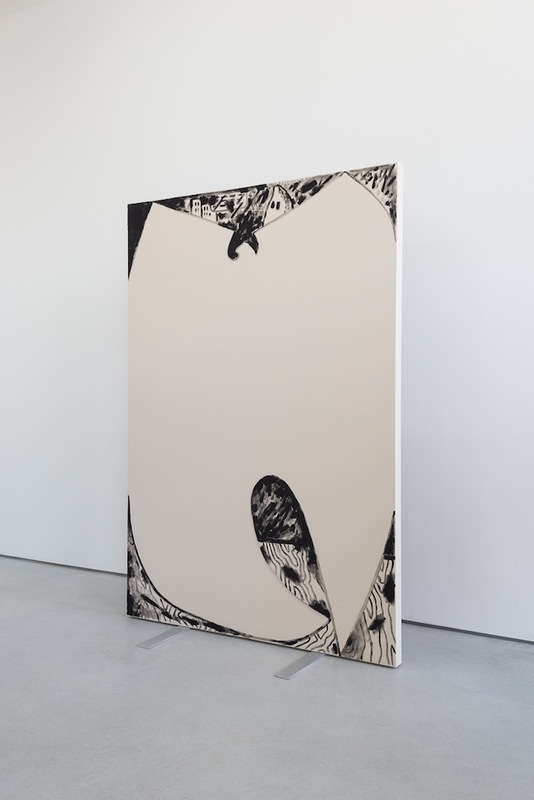 By combining these two very familiar cultural symbols, painting and Wu-Tang, I am able to examine both my relationship, as well as the dominant culture’s relationship to both. Hip-hop is a culture which formed in the margins, and painting is practice dominated mostly by white people. As I wish to participate in both, whether by proxy as a listener of hip hop, or as a producer of paintings, I guess I feel the need to ask questions. Do you listen to their music? Does it mean something to you? I do. But I think for this project, it is somewhat irrelevant. Their influence however is unparalleled. Not just in terms of music, but in terms of culture as a whole. They are to hip-hop, what Duchamp is to art. Are subcultures interesting to you? I think subcultures, generally speaking, can be more interesting, and much more powerful than a lot of art. That may sound funny coming from an artist, but if you look at various subcultures from around the globe, what you find are groups of people, varying in size, social position, gender and ethnicity, who are able to make something out of nothing. Subcultures have the ability to make sense of, to create and find meaning in the throwaways and margins of culture. I just saw a youtube video of teenagers in Bangkok, who dress like Latino gangsters. Tattoos and all. How incredible! Did you know that American pop country is huge in Jamaica? Cultural appropriation will always be fascinating to me. But it is a double edged sword. It has the ability to be constructive, as well as destructive. The problem is, and I suppose this is in part the question that I am asking with this show, is at what point cultural appropriation is it emptied of all meaning? When dominant culture borrows or more blatantly steals from a sub, or marginal culture, what is at stake? 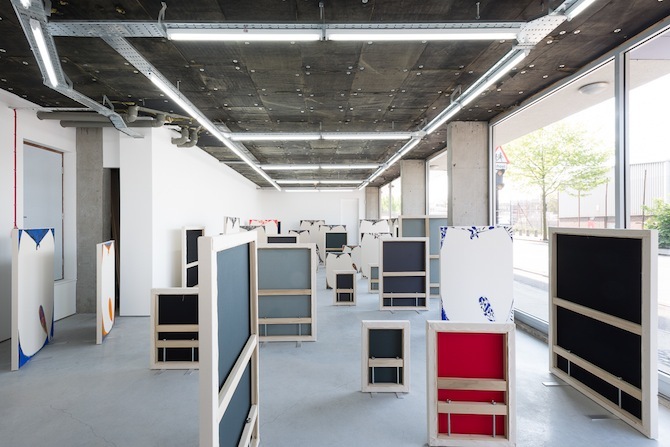 Is it possible to present a symbol within an art space and objectively examine its function within culture, while simultaneously and sincerely celebrating that same symbol for what it is? You sometimes add small details into your motifs, like flowers or camouflage patterns. Do these have a specific agenda or are they random? Anything recognisable in the paintings other than the “W” itself, is for the most part random. That is not to say meaningless. I think of these elements, like the flowers, the Philip Guston references, or even the camouflage as funny little gifts for myself and anyone who looks at them. These elements are no different than the squiggles, blobs and dots in any of my other paintings. They should just be seen as reminders that at the end of the day painting, while it is really weird and maybe kind of pointless, is also really special and human. You live and work in Portland. Does the city have an influence on you, and if so, how would you describe it? Portland is a beautiful city. It can feel a little isolating at times in terms of the art scene, but honestly there is no shortage of intelligent, talented and passionate people. We just lack in the volume, capital and infrastructure that other more established art cities benefit from. What we do have, and what keeps me here is the lush and diverse landscape. If I drive in any direction for an hour I can be in the mountains, at the ocean, in the rainforest, or wandering the desert. You can’t beat that! 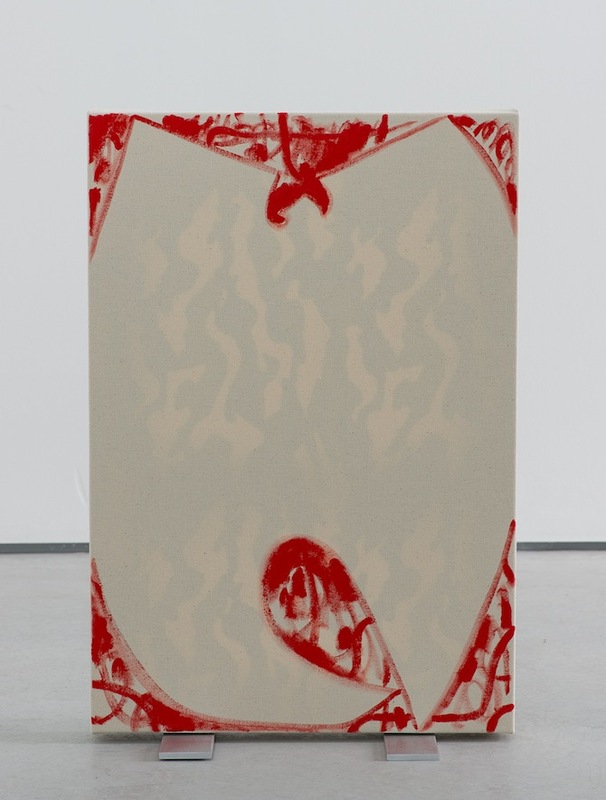 Luc Fuller's works will be represented by Rod Barton at Art Berlin Contemporary in September 2014.